Wow. There were some days, when my children were growing up, that I couldn’t imagine them calling me blessed. Some days they were rotten little stinkers and had me near pulling my hair out. Motherhood, especially Christian motherhood, is not without challenges, as I’m sure you know and have experienced. Most days, we are so wrapped up in the daily minutia of living – the laundry, the cooking, the shopping, the discipline, that we don’t stop to think about how it is all Kingdom work. Yes, laundry and discipline are Kingdom work. In this verse, the Hebrew word for arise or “rise up” (קָ֣מוּ ka·mu) is translated “ as “to accomplish, to endure, to build or establish, to strengthen, to succeed.” What a beautiful word picture! We are building, establishing and strengthening children for the Lord! We are tasked with raising sons and daughters of the King. We are charged with influencing their hearts and lives. I’m not going to lie. Many days, it will seem like thankless work and, honestly, the goal is NOT to have your children rise up and call you blessed. Nope, it’s to raise disciples of Christ. If we do that effectively, one day they will dance with Jesus and THEN they will call you blessed for having led them to Christ. In the meantime, we have this earthly mothering business to take care of. Little ones may not be able to articulate their thanks but may show it in other ways: snuggles, kisses and those smiles that melt our hearts. When my youngest was small and we were teaching him to say “thank you”, it always came out as “thankee”. The words may have been off, but the sentiment wasn’t. He was learning to give thanks even if it was simply for his bottle or a cookie. He was beginning to cultivate a heart of gratitude. As my children grew, they probably said “thank you” a whole lot less until….they became men. Now that my children are grown, I hear, almost daily, “thank you, mom”. But now the thank you’s aren’t for milk or treats, they are for life skills, love and lessons taught. Recently, my youngest, who has a toddler of his own, texted me. He wanted to thank me for loving him and disciplining him. He said that until he became a parent, he had no idea how tough the job really was. His daughter, I’m sure, is the product of my saying, in my head, many times “I hope you have a child just like you”. She is as precocious and active as he was at that age. Now, he gets it. So back to Kingdom work. Every action and every chore that you do, every word that you utter in the journey of Christian motherhood, you are doing to raise disciples of God. By providing clean clothes, feeding hungry bellies, saying grace before meals, reading your Bible, demonstrating compassion to strangers, attending worship and Bible Study – all are part of the job of Christian motherhood. 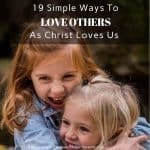 All are daily demonstrations of loving others as God loves us. All are tasks that help your child to one day arise and call you blessed. The laundry, the cooking, the cleaning, the nose wiping, the reprimanding, all of it, do it as working for the Lord, not for human masters – not even your husbands and little human masters, your children. The next time you are frustrated by tripping over toys or stepping on legos (those things hurt!) or spilled milk or even mounds of laundry, thank God for giving you your children, your husband, your salvation. You are raising children for the Kingdom of God and that is important work! The last part of this verse, “her husband also and he praises her” should not be overlooked here. How proud of his wife when she works diligently without complaint to raise disciples, manage her home and live an exemplary life for Christ! (For more on this, see this post Her Husband is Respected at the City Gate). If you still have little ones at home, I highly recommend these books on Christian parenting. 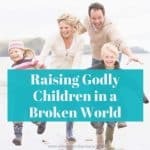 We can never have too much help in raising godly children. Do you see Christian motherhood as Kingdom work? I’d love to hear your thoughts. If you want to dig deeper, check out my book, The Complete Proverbs 31 Wife: A Verse by Verse Exploration of What it Means to Be a Proverbs 31 Woman in Today’s World.